War_Adm1ral had the most liked content! What I'm the world is going on?? Hello all, It comes with sad heart that I am officially renouncing my status as a community member. I've considered this community home for approximately 4 years and I never thought a day would come that I would have seen myself a part of a community that last longer than 1 year. Although I wasn't here for the first 2-3 years of ADK's birth I still feel I have seen us accomplish many milestones. With that said, it is great to consider the accomplishments that have been achieved over the years, but where there are happy moments - there are nor so memorable moments. It is my belief that communities of this type have every possibility to exist and function for very lengthy periods of time, but it takes dedicated and special people to make that happen. Regardless if they have the highest of authority or just an average member..its the people that make of the community. I feel over time many ideas that have been offered up or brought forth by admins and members alike were so quickly disfavored. It is no surprise that over time things change. Those can be changes that are both good and unfavorable. Nonetheless I feel a large combination of small factors have forced me to make my decision. These include things both controllable and things that ADK as a community cannot defend against. Some of things: Failure to split responsibilities evenly amongst management and adminship alike. Even if the highest ranked members have things to do they shouldn't be burdened with tasks that remove them from being a part of the community rather than working for it. Some sacrifice is obviously worthwhile and needed. We should have allowed members of all levels to actually have time to enjoy playing games with one another. Rather than constantly shutting themselves out to hang out with on their "best friends/buddies". The types of people requesting to join. The mindset of the world player base appears to have shift some and it seems most people are abandoning or not holding to heart the ideals of a community or group. The type of leadership in effect. I feel the current chain of command is so unstable and now officially at this point there are virtually 4-5 vacant positions of Community Managers/Admins. These people are supposed to be some of the most trusted and loyal members of the community who help share and suspend the load of the community all together. Now we only have legacy and honorary positions essentially and it is just bad business. Considering the above point..It has come to my understanding that things have just about always been structured like a totalitarian dictatorship. I'm not saying the system can't work because look where its gotten us. But it can't work forever and when people feel unappreciated and overburdened with work it actually becomes depressing to see the amount of work and dedication one has put in only to see it eventually burn, wasted, and forgotten. I'm not saying that the experience has not been worthwhile as I have learned a lot and have had a lot of great experiences and appreciation with how the community was operating for the first 2 years of my membership. Considering what events have transpired in the last 8 months I remain convinced that ADK was in fact heading in a direction that may not be recoverable. I chose not to believe it and attempted to have some faith in the system but I feel ultimately that on average members nowadays don't feel motivated and happy as those who were around for the first 5 years. It used to feel like a large family but after additional drama and ineffective management of such started springing up, people started forming little cliques and private/exclusive groups within ADK. Game sections no longer operate in unison and instead some sections are just outright acting as their own little community. I refuse to go into other specifics as there have been just too many occurrences with situations over time that constantly kept digging a bigger hole for the community to get out of. You would have a hard time finding tons of other members more loyal than I and I want that to be clear that ADK has had my loyalty for the past 4 years. But I can't keep trying to remain loyal when the community does not do the same for me in return. The thing I remained dedicated and loyal to has fundamentally changed. It has become a waste of energy and to a degree has become emotionally taxing to feel slave to a system that no longer inspires people to be a larger part of. ADK has dark times ahead and this looks to me like the damage has to far spread. The phoenix was fitting for ADK but if it has been corrupted at all levels it will eventually one day not rise from the ashes. I feel a massive disease if on the loose and I'm sad to say that I feel it will eventually consume whatever is left of the community. I wish it well though and hope that the ideals that represents ADK once again stands out and outshines all odds but from this point forward, I will not be a part of it. I have big ambitions for my own goals and life changes and wish good luck for all. I have served and enjoyed working with many members of the community both active and long gone. Unfortunately no. Doesn't mean it can't still happen but the game is currently no sponsored or actively seeking sponsorship. If you find enough people for it you could have a shot at getting it set up. While Valor and Mystic hold a knife to each others throats we stand readily for the moment. Putting the trust in our instincts and intuition. This sounds great. What time is the event? 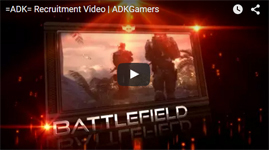 Welcome to the =ADK= Forums @bascomz. What are your hobbies outside of gaming.